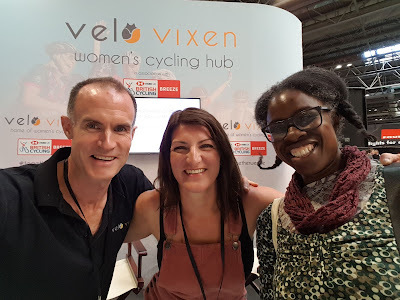 As well as browsing round the stands and meeting cycling folks at the Cycle Show at the Birmingham NEC I was also involved in a presentation at the Velovixen/HSBC British Cycling Breeze women's cycling hub. The idea was to have a stand sponsored by two organisations heavily involved in the promotion of women's cycling, and to have presentations from different women throughout the Cycle Show, talking about their cycling and different adventures and experiences that they've had. Anna Glowinski, the designer behind Annanichoola and Anna's Legs was the anchorwoman and she did a stirling job. She also gave a presentation about her life in cycling, and how she now has had to learn to live with fibromyalgia, a condition which has stopped her from cycling as much as she wants. 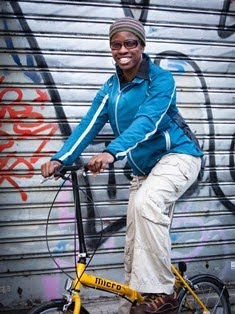 Presentations were given by folks like Olympic track cyclist Joanna Rowsell, BMX World Champion Shanaze Reade, and Ishbel Holmes, who talked about her round the world cycling expeditions. I had the privilege of being one of the presenters too, and spoke about my cycling and how I got into it. I think I was the warm-up act for the other folks to follow, so was the first presenter. I didn't have them packed to the rafters where I spoke, but I did get a fair bit of engagement from the folks who were there, and the Breeze champions who were there found my talk interesting. It was good to be interviewed by Anna, as I've known her for many years so I didn't get that nervous about speaking in front of an audience. In fact it was quite relaxing, convivial experience! I think a hub like this is a great idea as it gives women a chance to hear about others' experiences, get tips and make contacts. And having it in the middle of a large cycle show means you've got a captive audience. In fact, the hub was also popular with men too. My 23-year-old nephew came to the Cycle Show too, and he found the presentations on the hub very interesting. Thanks to Phil Bingham of Velovixen for giving me the opportunity to speak on their stand.